Chris Rush is one step closer to the ABA National Championship with a first place win and $393 in an ABA American Fishing Tour bass tournament held on Coffeen Lake this past weekend. Rush brought in a three-bass limit of 7.13 pounds, catching his fish on a jig in shallow water. In addition to the overall win, Rush weighed-in the Big Bass of the tournament, a 3.099-pound largemouth bass. 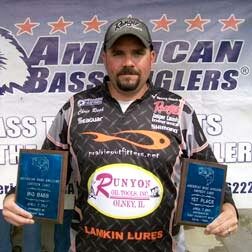 Second place went to Joey Gallagher with a weight of 6.74 pounds, while Earnest Smith finished third with 5.75 pounds. The bass were really biting on Coffeen Lake as every angler caught their limit of bass.